It’s no secret that in recent decades the financial woes of traditional newspapers have continued to get worse. It’s also no secret that Americans’ trust in the news media has dropped over the past decade. According to a recent report from the Pew Research Center on the state of the news media, total estimated newspaper industry advertising revenue in 2017 was $16.5 billion. That’s a 10 percent drop from 2016 and a 66 percent decrease from when advertising revenue hit its peak in 2000. And while circulation revenue has incrementally increased in the last 18 years, those gains are just a drop in the bucket when compared to the industry’s losses. Decreases in advertising revenue have left media organizations looking for new sources of income and, in some cases, turning to completely new funding models. But as journalism funding models change, so do the ethical challenges associated with them. Media companies have to keep the lights on and earn audience trust. One alternative to traditional, advertising supported media is grant- and donation-based nonprofit investigative journalism. According to Andy Hall, executive director of the Wisconsin Center for Investigative Journalism (WCIJ), the model has seen a rise in popularity since 2009 but has been around for decades. WCIJ was one of those newsrooms. Having launched in 2009, WCIJ is a nonpartisan, nonprofit news organization that receives approximately 85 percent of its funding from donations from foundations and individuals. This model of funding presents some obvious ethical challenges: How does an organization maintain independence when it is almost completely dependent on financial support from donors? WCIJ, Hall said, confronts this concern head on. The fundraising policy of the organization makes it abundantly clear that it maintains editorial independence from those who want to support their work financially. And as a second level of assurance, WCIJ’s board of directors has the final say on whether or not the organization will accept a contribution. Additionally, those looking to donate must do so publicly, as WCIJ lists the names of all organizations and individuals who provide funds to the Center on their website, no matter the size of the contribution. Hall stated that he has torn up donations that did not have a name attached to them and has returned others that came from elected officials or other parties that might have resulted in a conflict of interest. Transparency is key to earning the trust of readers. Maintaining editorial independence from financial supporters is not a challenge unique to nonprofit newsrooms. It’s also an issue for media companies that are adopting brand-new funding models. Take, for example, The Colorado Sun, a journalist-owned, Denver-based news organization that began publishing in September. The Sun is supported financially in three primary ways: Donations from companies and individuals, memberships — subscriptions — to The Sun and grants from Civil, an organization interested in using blockchain technology to build a sustainable model of local journalism. The organization takes a similar approach to WCIJ in its handling of donations. The Sun publicly lists the names of its sponsors on its website and also includes the names of members who have contributed more than $1,000 in support on the same page. 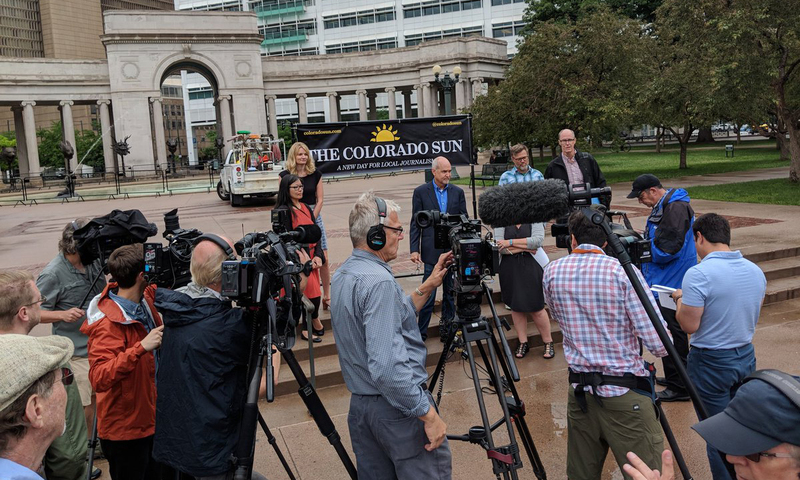 Larry Ryckman, editor of The Colorado Sun, said the decision to share this information publicly is a commitment to being transparent to The Sun’s readers. “We feel it’s critically important for us to be transparent with our community and for people to know where we get our significant money,” he said. Ryckman also said The Sun is clear with sponsors that it maintains editorial independence, and that if they do write a story about a sponsor, the sponsor’s support of The Sun is noted in the story. Support from Civil, though, is what makes The Sun’s funding model unique. Civil has provided the Denver-based publication with several grants to help it get started, Ryckman said, but the ultimate goal is to eventually be sustainably funded through memberships, sponsors and, potentially, investors. Journalists, though, would always maintain a majority stake in the company, according to Ryckman. 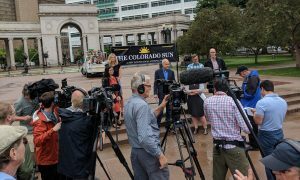 “The only way The Colorado Sun can be successful and sustainable is for the people of Colorado to support it,” he said. The Colorado Sun is advertisement-free and stories are available to anyone, not just members. This advertisement-free model has also been adopted by The Athletic, a sports journalism outlet that has seen rapid growth since its launch in January 2016. Fueled by venture capital, the site, which requires a subscription to access stories, has been able to expand into nearly 50 markets in just two years, and has added some of the biggest names in sports writing to its staff. However, venture capital-backed journalism and paywalls introduce ethical concerns. Adam Hansmann, co-founder and chief operating officer of The Athletic, said the sports journalism company has addressed these concerns straight on. “Investors have zero involvement in any kind of editorial decision making,” Hansmann said. He also reported that there are “multiple filters” between investors and the editorial team, and that he and CEO Alex Mather, his co-founder, “rarely” have any involvement in the editorial side of The Athletic. Instead, they prefer to leave those decisions to the editorial team they have hired and to focus on growing the business. Hansmann also acknowledged that ethical questions about the site’s paywalls, and whom they provide access to, are valid. In response, he pointed out that 30 years ago the majority of American households received a newspaper on their doorstep every morning, and that The Athletic believes a market in which people are willing to pay for the news they want still exists. And based on the subscriber-retention rates of The Athletic, it appears the company is having success creating those markets. Hansmann said that more than 90 percent of users renew their subscriptions each year. Additionally, Hansmann said The Athletic unlocks stories when it is in the public’s best interest, and referenced the media organization’s free coverage of the trial of former USA Gymnastics team doctor Larry Nassar. In an era of real uncertainty about news media revenue, funding models for new organizations are changing. Whether this transition back to reader-oriented and supported local journalism will help return Americans’ trust to news organizations remains to be seen.